Somewhere along the line my husband got his hands on a bunch and I mean a bunch of these cute little tins. I thought the tin would be perfect for this craft because I could hide our thankful messages inside. First, I covered the tin with brown book cover craft paper. I would have used regular brown construction paper but had none on hand so I opted for the next best thing. School glue worked fine for this part. Then I cut out feathers from construction paper and wrote on them what the kids told me they were thankful for, in their lives. I really loved this part! And I'm seriously not bragging when I say my son wanted to keep telling me what he was thankful for but we ran out of room. That's ok as we have another activity that starts this week where he will have 25 days worth of writing things he's thankful for! Anywho, back to this activity.... I used a hot glue gun to stick on the feathers, added some googly eyes, nose, wattle and feet. Making our turkey was fun but this next part was the hilite! I asked my kids what they were thankful for, about their Grandparents and each of them started sharing right away! It was really great hearing what they are thankful for about them! It warmed my heart so much and I know it will for my parents too! Ok, so I wrote what the kids were thankful for about their Grandparents on a piece of white paper. Once finished I cut out pieces of the paper and asked each of my children to sign their names to it. This way when their Grandparents read the little notes they will know which child said what. I had my 9 year old write his name underneath the message and had my 4 year old write her name on the back. With just learning how to write her name her letters tend to be big so this gave her more space. 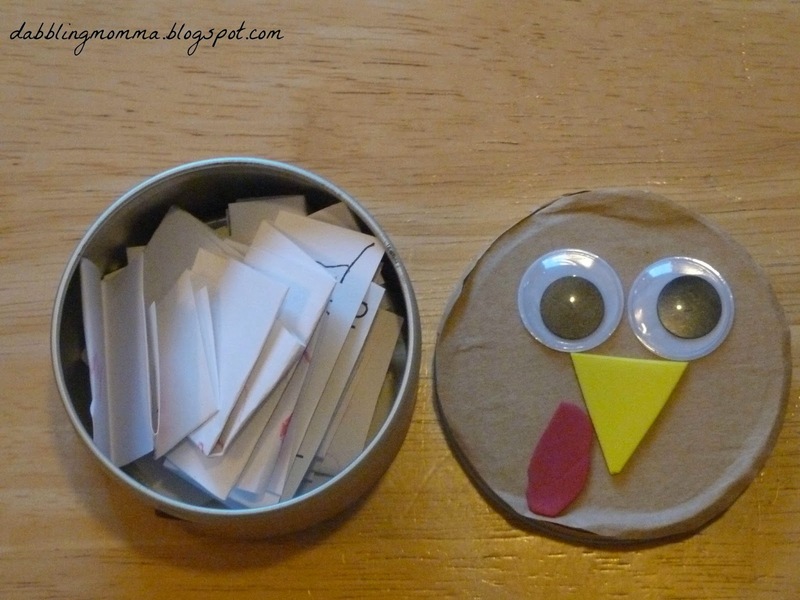 I folded up all the thankful messages and put them inside the turkey tin. Now my parents will have a cute little turkey that they can display through Thanksgiving and then read their Thanksgiving messages on Thanksgiving day or whenever they choose. I thought this was a nice way to include my children's grandparents in on our Thanksgiving holiday even though we will not get to physically spend it with them. One last thing I did before shipping off our turkey was adding the initial of my children's names on the backs of the feathers. I wanted their Grandparents to know which child shared what they are thankful for and thought this would help. How do you include far away relatives into your holidays ? I would love to hear about it, please share in the comments below! What a great idea! I like how it can help them to remember what all they are thankful for. Someone's thankful for tv. So am i. Thanks, Natasha!! t.v. was my son's but I'm thankful for it too!! This is a very special "craft" to do with the children so grandparents can know how special they are and see how special the kids are. Thanks Patty! I believe so strongly in how important grandparents are in the lives of their family and grandchildren. My hope was to convey that in some way. Thanks for the comment! Hi Priyam! Glad that we can connect! Thank you for commenting and following! I love what you did Susen with the kids. Such a great idea for the grandparents to enjoy and for the kids to create. Our family lives far too, and this would be a perfect way to show them our love and thankfulness. Thank you, Heather! This was a feel good for me and the kids and for sure it will put a smile on Grandpa and Grandma's faces too!! Thank you for commenting, Tarana! This was a heart warming activity and I know will make Grandpa and Grandma so happy! Thank you, Catherine!! I appreciate your taking the time to comment! Thanks for stopping by, Coombe! I appreciate the comment! 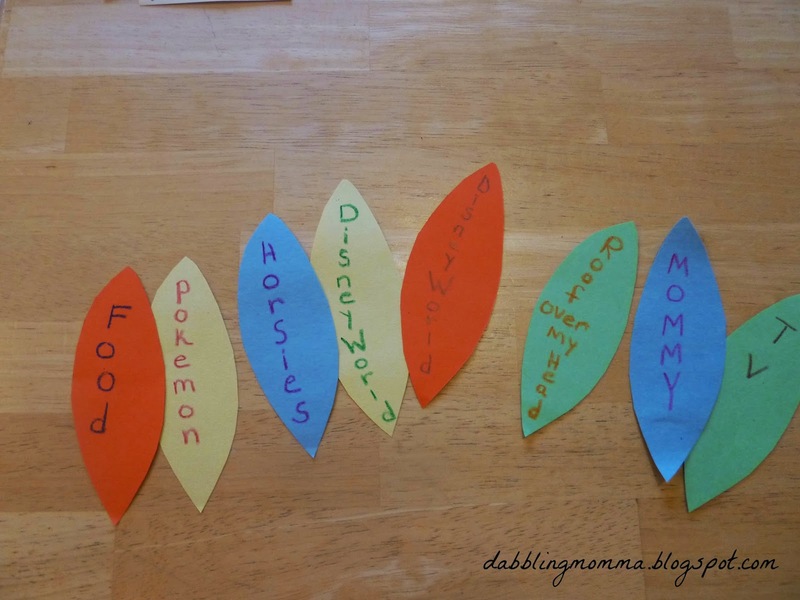 Awww, this is lovely and such a great activity to do with the kids. Thanks for linking up! I love this idea. It is so cute and wonderful activity. Hi Keri, thanks for the chance to share! Hi Joy, thanks for stopping by and commenting! I hope you and your kids have fun making it. 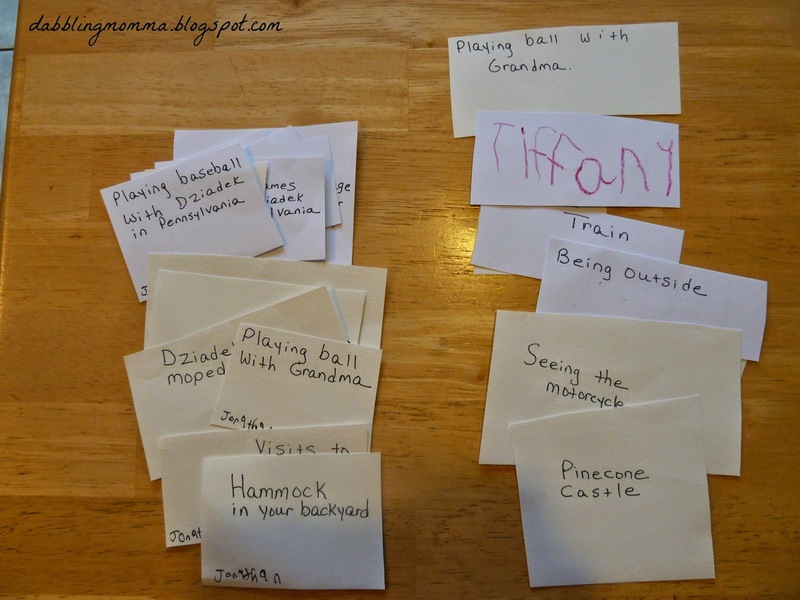 My kids enjoyed sharing the things they were thankful for about their Grandparents the most! 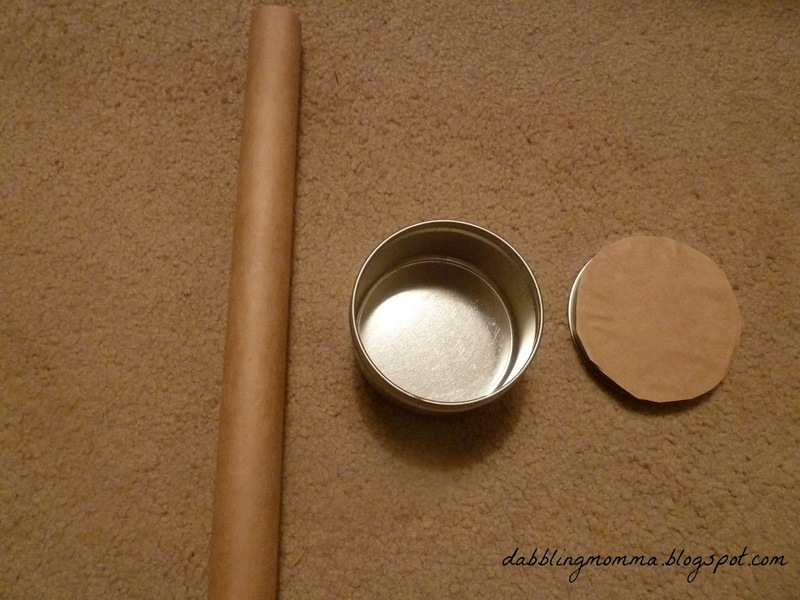 I love how you used the little tin, this is such a great learning tool. There are so many kids that do not learn the values of being thankful.Thank you for sharing on Oh My Heartsie Girls weekend linkup! Thank you! We love the tin too, perfect for hiding those hidden messages!! 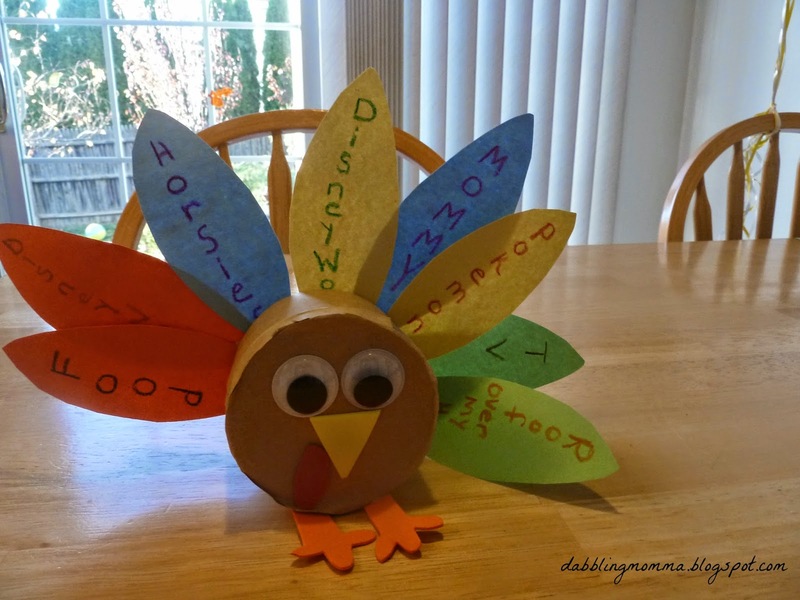 That's what my kids loved the most about this craft, thinking up things they are thankful for about their Grandparents! This turkey is a reall cute idea! I love that the grandparents will get the messages! Thanks for sharing! Thanks, Debbie! I can't wait for the Grandparents to read the messages! Thanks for stopping by and commenting! This a really good idea. I'm always looking for more craft ideas for the kids during the holidays. Thanks for sharing with us at Mommy needs a time out Thursday. Thanks, Samantha! I appreciate your comment. This craft was alot of fun and easy to do! Hi Dee! And I'm looking forward to the grandparents reading about what the kids are thankful for about them!! Awesome turkey so full of love and thanks! What a great idea and I hope everyone makes one! I'm glad you like it Crochet Hooks! Appreciate you comment!